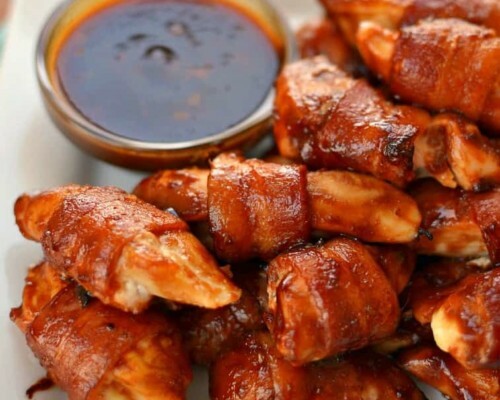 Sweet Bacon Wrapped Chicken Bites are super easy, quick to make and family friendly making for the perfect weeknight meal or party appetizer. In small saucepan combine soy sauce, water, brown sugar, sriracha, Worcestershire sauce, ginger, ketchup and garlic. Simmer while you prepare the chicken. Set a small amount of sauce off to the side for dipping. Preheat oven to 375 degrees. Cover two large cookie sheets with aluminum foil and spray the aluminum foil lightly with nonstick cooking spray. Bake 20-25 minutes basting every 7-8 minutes with the sauce. Turn broiler on the last 1-2 minutes of cooking. Stay close by when the broiler is on. They cook quickly and are very unpredictable. Rotate the baking sheets in the oven so each one has a chance under the broiler. Sriracha is hot chili sauce found in the Asian food section of your grocery store. You should add a little at a time till you get it to your taste. I have readers that will add 1/2 teaspoon and think it is hot and I have some that will add 4 teaspoons and think nothing of it. Everyone has different heat tolerances. I use ginger paste in place of the ginger. It is less expensive and its shelf life is a little longer.